WilliamGaddis is a Legacy Library. Legacy libraries are the personal libraries of famous readers, entered by LibraryThing members from the Legacy Libraries group. » William Gaddis's legacy profile. WilliamGaddis is also an author. 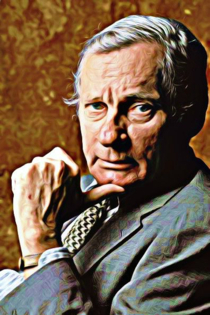 » See William Gaddis's author page. About meWilliam Gaddis (1922-1998) published his first novel, The Recognitions, in 1955, a behemoth of a debut at almost 1000 pages that he'd begun in 1947. When the novel fell largely on deaf and especially dumb critical ears, Gaddis, who'd envisioned a similar blockbuster reception for it that would've allowed him to write full time as was awarded Ralph Ellison with his first novel, Invisible Man, instead worked as a speechwriter and documentary filmmaker for various companies, including Pfizer International, Eastman Kodak, and IBM, to support his family. Gaddis would publish two more novels over the next twenty years, 1985s Carpenter's Gothic, his most accessible novel to date and a PEN/Faulkner Award nominee (watch Malcolm Bradbury's interview with William Gaddis in 1986 here); and A Frolic of His Own (1994), his second novel to win the National Book Award, a tome in which Gaddis mocked the legal world and the United State's obsessively litigious culture in the same manner -- with pure non stop spot on barrages of dialogue -- that he levied at U.S. capitalism run amok in JR.
Agapē Agape, an early work left unfinished in the 1950s, was resurrected by Gaddis forty years later following the success of A Frolic of His Own, and became his final novel, completed only weeks before he died. It was published posthumously in 2002, along with The Rush for 2nd Place: Essays & Occasional Writings. In 2012, the Dalkey Archive reissued Gaddis' first two novels handsomely bound. Buy them. Help keep William Gaddis in print. The Letters of William Gaddis, edited by the postmodern critic par excellence (and all-things-William Gaddis-expert), Steven Moore, also arrived courtesy of Dalkey Archive in 2013. About my libraryLibrary being compiled initially from the 1,243 volumes itemized in Washington University's, The William Gaddis Papers. Mr. Difficult: William Gaddis and the Problem of Hard-to-Read Books by Jonathan Franzen (a con article).